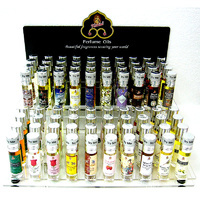 Kamini Perfumed Oil DISPLAY STAND with 3 x 12 top fragrances plus 12 testers - 48 bottles. 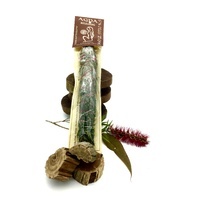 Display measures 19.5cm wide x 27.5cm deep x 23.5cm high (at highest mid point). For limited time only the acrylic display stand is free when you purchase this item. Selected fragrances will be as follows. 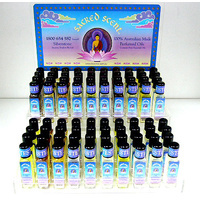 If you wish to stock different fragrances than these, please advise us in comments. 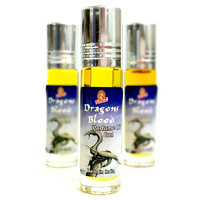 Frangrances are Aphrodisia, Frangipani, Dragons Blood, Jasmine, Lavender, Musk, Night Queen, Patchouli, Rose, Passion Potion, Vanilla and Ylang Ylang.